This helped me finally, after about an hour or so of searching for a solution. My issue was that the game was being forced into 800xWhatever mode and not full screen. I have no idea how you learned about the command line options, but after trying your options I simply replaced your screen size with mine and voila. Hope your post helps others out there, this game rules! Yeah but there’s still problems when in custom 1080p mode. For one, everything is stretched horizontally. Adjusting cg_fov to 115 or higher produces a disorienting fisheye effect when looking around. So you get distance/size distortion as you see something to the side and then center your view onto it. I’ve also noticed some weird monitor overscan type result with 1080p, where the hud elements are much closer to the edge of the screen than in any of the non-custom r_modes. Having said that I still prefer the native 1080p @144Hz as you can see further and less lag than in a non-native non-scaled resolution such as 1280×1024. I wish it weren’t so. Incidentally the engine uses internally a 640×480 virtual world which is interpolated to display resolution, it’s actually hard-coded and not even a define. Anyways, ET will never look as good or play as well as on a fast CRT, unfortunatelly. I’ve always had weird distracting aliasing on vertical edges when moving mouse. A new machine and Windows 8.1 + the microsoft mousefix + regedit a compatibility bit for the app fixed that. Now it’s finally smooth, three years and many hundreds of dollars later. 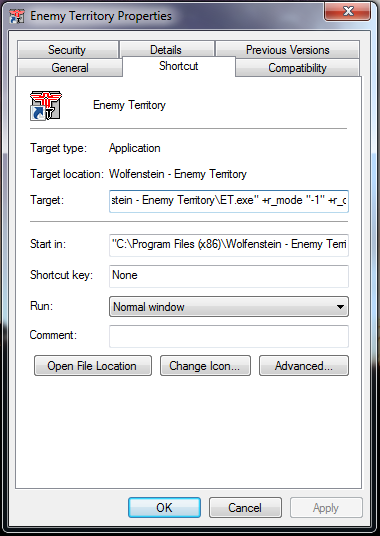 the app compat bit only works in 8.1, still no fix for win 7, nodttoditmousebatch for both explorer.exe and et.exe…and run the rundll32 thing after regedit, as posted elsewhere for this mousefix. In addition to this excellent solution, the cg_fov for 16:10 resolutions (i.e. 1440×900, 1680×1050 and 1920×1200) should be 100.39 and for 16:9 (1920×1080) 106.27. One could edit etconfig.cfg, too. Thank you for posting this, I was looking for a way to force higher native resolution. So I added your code lines to the target, now ET says open GL isn’t working, any thoughts? Last I checked this fix is still working. Can you post a screenshot of the error? I tried to do this but my screen is to zoomed in, so i can only see 2/3 of the game. any tips on how to make it work? I haven’t had any issue with this at all, what operating system are you having this issue on? Are you sure you modified the shortcut correctly? Guessing this is because you have Display Scaling on. You should put it to 1/20 of that resolution I think.